1.21 Jigawatts ! A Pronounciation Guide. "Jigawatts! Doc, What the Hell is a Jigawatt?" Marty McFly to Doc Brown in "Back to the Future"
I got an email recently asking if "jigawatt" was a real term, and what terms were used to describe large numbers of watts. Well, is "jigawatt" real? The answer is "yes" and "no"! At first I thought, like many fellow scientists, "Surely, Christopher Lloyd is just having fun with us! That's not how you pronounce gigawatt!" Shortly thereafter, I got a nice laminated sheet from IUPAC with units and prefixes on it. They took special care to point out that giga- (the correct spelling!) was pronounced with the first g as a hard g, and the second, as a soft one! According to my Merriam Webster's Collegiate Dictionary (1993) the first (preferred) pronunciation is " 'ji - ge " (as in jiggle) and the alternative pronunciation is " 'gi - ge " (as in giggle). OK, so you don't believe me! But what about this pronouncing dictionary? Just to add fuel to the fire, fish have gills (as in giggle), but I drink beer by the gill (as in jiggle or jill). A gill is 4 fluid ounces, 118.3 mL in the US and 142.1 mL in the UK. 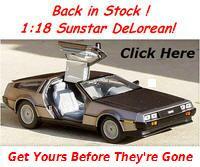 Get one of these Sun Star 1:18 die cast Back to the Future Time Machines while they are still in stock! The following table was adapted from NIST Special Publication 811 which is available online at http://physics.nist.gov/Pubs/contents.html or in PDF format from http://physics.nist.gov/cuu/pdf/sp811.pdf. My tax dollar at work! (You can download the Adobe® Acrobat® Reader from Adobe's website). © Copyright 2001-2009 Robert S. Rodgers. All rights reserved.